A few weeks back, my Twitter feed went nuts with black film geeks famous and not famous all saying Netflix dropped a series called ‘Pioneers of African-American Cinema’ that is mandatory viewing if you’re a student of the history or the artform or the culture. Streaming on Netflix, twenty episodes total. A few shorts in there, but mostly features, none over 100 minutes I believe. Most everyone who knows their history has heard the name Oscar Micheaux; off the top of my head there are four of his films here. Paul Robeson makes an appearance in one of the features. If you’re any type of black film geek, it’s the best kind of homework. It’s to be expected I guess when you know how historically expensive filmmaking is as an art form, but as far as the stories here: it’s almost exclusively from a ‘Talented Tenth’ point of view. If you’re hoping to see some pre-cursor to ‘Menace II Society’ or ‘Boyz N Da Hood’… nope, this ain’t the place. I believe it was in one of the Micheaux films that a fast light skinned woman was repeatedly referred to as ‘that yellow hussy’. That tickled me good, but be ready for a lot of that. In terms of things off the beaten track, there’s a black Western(!) in the later episodes. That’s the good. The bad? Shockingly, there was a blackface preacher who showed up in one of the more musically inclined films (in front of a black choir, which made it extra jarring.) There was also a yellowface character who briefly showed up as a minor character in one film. I’m not even going to psycho analyze that, I’m just telling you it was there. Worked away from the camera lately, setting the baseline for my voiceover work. Like being in front of the camera, you try to gravitate toward things you’re naturally passionate about, so for this I went to ‘The Book of Basketball’, the beginnings of black cinema, and luxury cars. There is a little argument over the facts that surround The Birth of a Nation. It was the first ‘blockbuster’ of American cinema; the techniques introduced in this film by D.W. Griffith revolutionized the art of filmmaking. Some of the investors in this picture were Hollywood’s earliest moguls; the profits they earned back from this film, in essence, bankrolled Hollywood. That, one of the opening cards, sets the tone for the film. The plot, for those unaware, revolves around two white families, one Northern and one Southern, and how the Civil War (and its causes) exposed the dark, ugly side of America (pun completely intended). And what causes might that be? How about the abolitionist movement and slavery, how about that? This card was shown after the main character, the Southern gent who is disheartened by the Civil War loss and the corruption of Reconstruction, sees a pair of white kids scare off some pickaninnies (and they are pickaninnies) by wearing a white sheet and acting like ghosts. You can probably take the rest from there. So many legacies were built off this one film. As said in the intro, it took the art of filmmaking to the next level. The money made from the film financed at least one major Hollywood studio. The black reaction was understandably hostile, the NAACP got the film banned in as many places as they had pull over. Way more important though, Oscar Micheaux was one (of many) filmmakers who decided the best way to counteract the negative portrayal of blacks in this film was for blacks to create their own films. So it’s very easy to argue that Birth of a Nation kickstarted black cinema. This line, said by the Senator’s mulatto mistress after Lincoln’s assassination, segways back into the story. Why were blacks so offended (if you haven’t seen the movie)? Was it just the Ku Klux Klan? Um, no. There was the mulatto mistress, turned on by the power of the white men she was surrounded by. There’s the great scene where the blacks are at work as Senators for the first time. Among the highlights of this scene, eating chicken while debating a bill, Senators taking their shoes off and putting their bare feet on the desk, the sneaking of whiskey onto the floor, and the one bill they did manage to pass, legalizing interracial marriage (immediately followed by the biggest party ever portrayed on film by a group of Senators). And did I mention that all of the major black roles in this film were (obviously) played by white actors in blackface? While President Woodrow Wilson would later claim he was ‘misquoted’ in his praise for the film, it is a fact that Birth of a Nation was the first film ever screened at the White House. Also a fact that more blacks were lynched during this period than any other period in history. 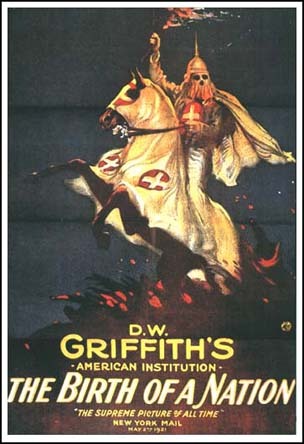 Birth of a Nation put the Ku Klux Klan in the spotlight, leading to a tremendous spike in their membership. This film, debatably more than any other film in American history, taught all parties involved the immense power of this artform. This line spoken by the villain of the film, the black Senator named (what else?) Lynch to the white heroine probably got more than a few brothers harassed (if not killed) in its day. As absurdly comical as that line is to me personally (I admit in 2009 I laughed out loud when I saw it and immediately memorized it to use when I get engaged), a lot of the gasoline behind the ‘why do black men lust after white women?’ debate can be found in this movie. Both in the main plot and in a subplot, black male characters proposition white women, and when they (of course) get shot down, the ‘brothas’ resort to force (or the threat of force) to get what they want. Thankfully in this day and age nobody’s bothered by a black man dating/marrying a white woman (hyper-sarcasm). For those interested, Birth of a Nation is public domain, and can be downloaded for free (and legally) from any number of sites online. Required viewing for those interested in the art of film, or black/American history buffs.